L-R) Dr. Isabel C. Romero (College of Marine Science University of South Florida) and Dr. Jon Moore (Wilkes Honors College at Florida Atlantic University) collect samples from midwater trawling that used a 10-m2 MOCNESS net during DEEPEND Consortium cruises. Photo Credit: Isabel Romero, courtesy of DEEPEND. Written By: Nilde Maggie Dannreuther, of Mississippi State University and Stephanie Ellis for Gulf of Mexico Research Initiative (GoMRI). 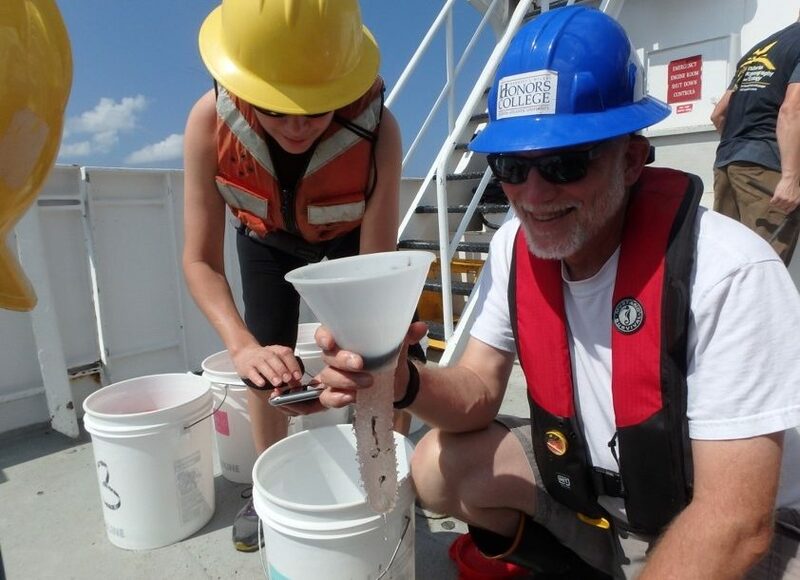 ST. PETERSBURG, FL – Scientists completed the first time-series study (2007-2016) of Gulf of Mexico deep-sea fishes and their exposure to polycyclic aromatic hydrocarbons (PAHs) following Deepwater Horizon. There was a 7- to 10-fold increase in PAH concentrations in fish muscle tissue in 2010−2011 compared to 2007, followed by a decrease in 2015-2016 to near levels measured in 2007. Water samples from summer 2010 measured at the depth of the subsurface oil plume (900−1300 m) had PAH concentrations up to 60.4 μg/L (compared to 0.1 μg/L background levels). Water samples from summer 2011 showed a reduction in PAHs concentrations, but they were still high (up to 48.2 μg/L) and at deeper depths (1200−2000 m) than 2010. Water samples from 2015 showed undetectable amounts of PAHs, indicating recovery after the oil spill. These results suggest an episodic contamination event in 2010 that continued through 2011 and a longer-term exposure to deep pelagic organisms than their shallower counterparts.